Appoximately 22 km from Livadia is Aliartos. There are about 3500 people living here. 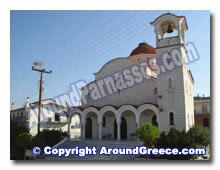 Aliartos is on the main road of Thivou-Livadias, and is inside the valley of Copaidos. The people here are mainly occupied with cotton and its related textiles products that are developed locally. A little out of the village are the ruins of the ancient city. You can also see the remains of the city's acropolis, and traces of the ancient theatre. At the monastery of Evagelistrias, which is dated back to the 12th century, you can visit the extremely old library. The monastery also operates as a guesthouse. 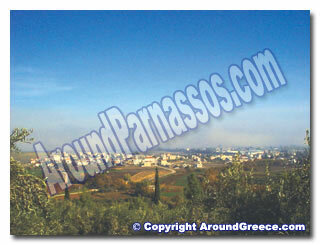 Aliartos is a nice village to visit, or to pass through whilst travelling around Parnassos. There are several places where you can enjoy a meal or drink, and sit back and admire the natural beauty that surrounds the village. 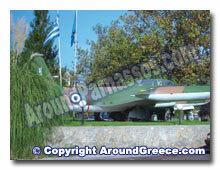 Visitors will also see the famous jet plane that is now on display in the main part of the village, and which is very popular with both locals and visitors to the region.